Get Algebrator Now and End Your Math Frustrations! We guarantee that Algebrator will teach you everything you need to know about Algebra. 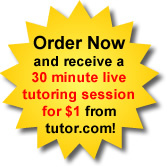 If for any reason you are not happy with the results, we will promptly refund your payment, while your tutoring session will remain free.